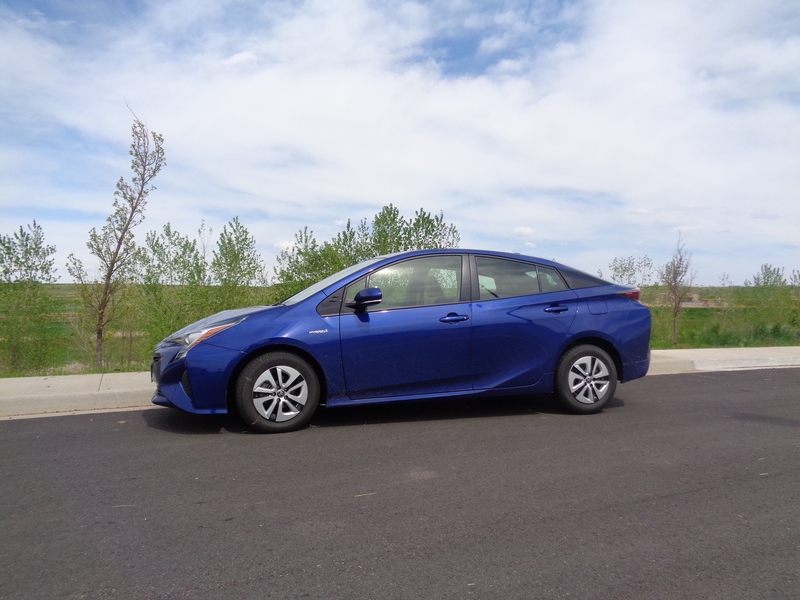 The 2016 Toyota Prius Two Eco is 3 inches longer in overall length than last year. The newest iteration of the famed (or infamous in kidding) Toyota Prius hybrid put on quite a show around here last week. The 2016 version is the fourth generation for the Prius Liftback. I’d been introduced three or four weeks ago to the model’s mainstream leader, the Prius Liftback Four Touring, so delivered to me was the Liftback Two Eco, same size as the Liftback Four, though lighter in weight and with improved efficiencies that amazed me. It accepted every bit of heavy low-end acceleration, relatively high speeds, hard braking and cornering from some of my tests, and delivered near-record fuel-sipping statistics. Even after redesign for ’16, which included moving the peak of the car’s roof forward a few inches, it is far from the best-looking hybrid and it is not the best-riding or handling; when it comes to fuel mileage, though, the Prius has been the leader since it showed up 16 years ago. In 330 miles during the week, the Prius Two Eco gas/electric hybrid recorded an overall average of 57.5 miles per gallon. The only time I’ve topped this, other than with a few electrics and plug-ins, was way back in 1994 with a gasoline-only Honda Civic VX hatchback that averaged a surprising 61.2 mpg. Daily fuel averages during the week I was in possession of the Prius were 51.5, 60.5, 69.3, 61, 58.6, 59.5 and 48.8. The first day’s mark and the last day’s were mostly highway driving; the other five were in-town, where the lower speeds are powered much more often by the batteries rather than the gasoline engine, thus the higher marks. The Prius Eco is equipped with a 1.8-liter, 4-cylinder engine mated to two electric motors and a new lithium-ion battery pack, which weighs less than the car’s former nickel-metal hydride battery pack. Engineers, in addition, tossed out the spare tire at the rear for more weight-saving (beneath the floor of the cargo area is a sealant kit and inflator), and the Eco rides on 15-inch Toyo NanoEnergy tires, which are very low-rolling-resistant. The Eco weighs 3,010 pounds. There is no rush, however, to buy these fuel misers. Prius Liftback sales have declined by 7 percent this year, yet it accounts for 31 percent of all gas/electric hybrid sales. Hybrid sales overall are down by 13 percent for the year. “The fact traffic for the Prius has slowed somewhat is a direct correlation to our current lower gas prices,” said Scott Ehrlich, owner of Ehrlich Toyota in Greeley. “When those pump prices climb again, so will the interest in the Prius.” Biggest showroom draw at the Ehrlich store right now is the improved Tacoma compact pickup (I’d guess that is what Ehrlich drives personally). With a gas-saving continuously variable transmission, the Prius Two Eco carries an EPA estimate of 58 miles per gallon in city driving and 53 on the highway. Rating for the Prius Four is 54/50. Noticeable in nighttime driving are zigzag LED taillights on the Prius. Switch the drive-mode system in the Two to Power, instead of Normal or Eco, and the driver feels shift points in the CVT. A nicety about this drive mode system is that it doesn’t default to normal or eco when the engine is shut down, and it remains where it was set when the car is restarted. The sticker price of $25,535 on the ’16 Prius Two Eco is without satellite radio or a rear wiper, and with a small backup camera screen. The rear suspension is improved with a double-wishbone and trailing arms setup. 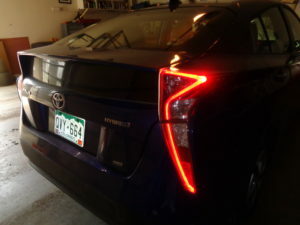 Zigzag LED taillights are something to see after dark.